No one questions what the food is made from until Robert Thorn (played by Charleston Heston) becomes suspicious and starts to investigate. Toward the end of the film Detective Thorn discovers that dead human beings are being sent to a processing plant and ground up in large machines, compressed into Soylent Green. Thorn is totally devastated and in unbelief, which is how the movie ends as he dies of a gunshot wound inflicted by thugs of the elite, trying to keep him from talking. But the truth is now out... SOYLENT GREEN IS MADE FROM PEOPLE!!! The abortionist is killing what God has made. If Americans weren't so sexually promiscuous and irresponsible, there wouldn't be a constant never-ending supply of unwanted babies to the abortuaries all across our nation! A fetus is a child, not a choice! 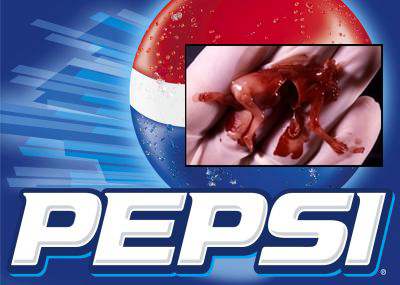 Pepsi Cola thinks a fetus is a flavoring ingredient. Satan is so evil that he has possessed an insane group of people to actually dilute ground up fetuses into our foods. Literally, you're eating human beings in Kraft and Pepsi Cola products. It's just like the shocking 1970's sci-fi thriller starring Charleston Heston, SOYLENT GREEN. On May 17, 2012 the Oklahoma Senate passed Bill 1418 which bans using aborted fetuses in our food supply. What has our nation deteriorated into when our lawmakers have to pass laws prohibiting putting ground up humans into our food? My God in Heaven, say it isn't so! I need to go take a long walk and pray.